What is a family of germs to do when their home is destroyed with a new epoxy antibacterial flooring? Poor Billy Bacteria. Just a short while ago, he and his family were living a privileged life in the kitchen of Burt’s Restaurant. They had all the food they could eat, plenty of room to multiply, and the aroma of absorbed decay that wafted up to meet them was the best they’d ever smelled. 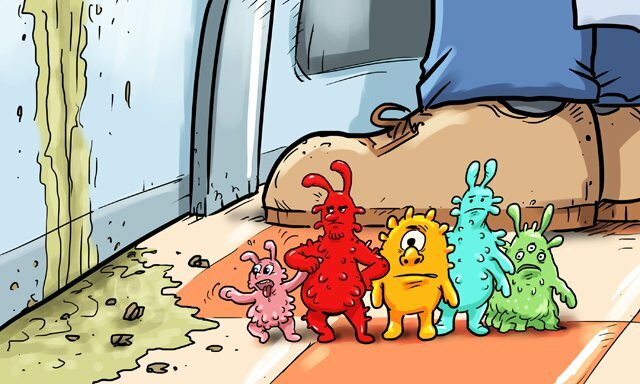 If you want to ruin the habitat of the germs and bacteria in your establishment, then consider replacing your floors with antibacterial epoxy flooring by Everlast Epoxy. It is not only antibacterial but it is also resistant to many fundi, yeasta and viruses. See to see how easy it can be to get new healthy flooring!